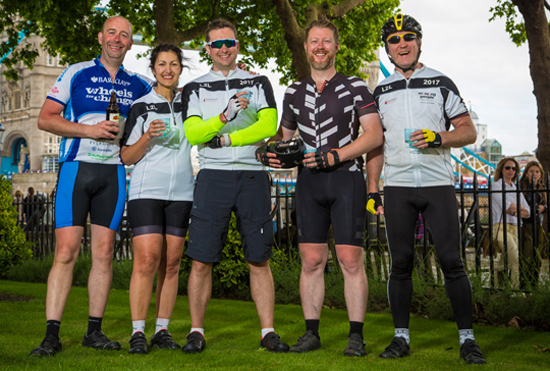 In early June, 5 incredible cyclists took to the roads for 3 days, covering almost 300 miles, to raise money for Missing People. 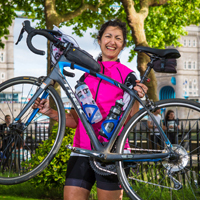 Supporter and relative cycling-newbie Esra Parr tells us about her experience in the saddle. 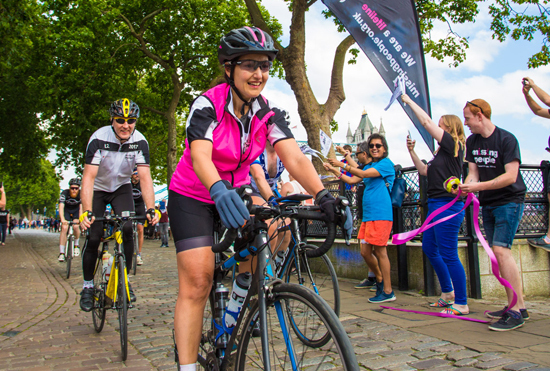 I’d always fancied taking up some kind of physical challenge and having known about and sponsored Missing People's previous Edinburgh to London cycle challenge last year, 3 days seemed far easier! I had my hip replaced back in October 2014 and running was off the cards, but cycling was deemed excellent. So, with less than 6 weeks to go and not having done any real cycling for nearly 30 years, I signed up. 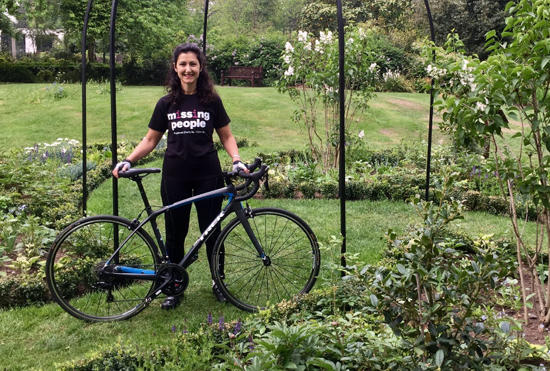 I initially thought I could undertake the 282 mile journey on a hybrid bike with regular pedals. Within a week I’d been talked out of it and decided to invest in a lightweight road bike with cleats. I needed to give myself the best chance possible. Training began in earnest and I built up from 2 or 3 times a week to almost every day. Richmond Park was my initial training ground and I slowly progressed to longer distances. ‘Miles on the bike’ was something I heard repeatedly. How right they were. It was a very steep learning curve - everything from testing out different saddles (undercarriage issues can be quite serious if you get it wrong! ), padded shorts and gloves that fit you and do the job well, to learning how to reach down for and drink from your bottle, open a gel or peel a banana and consume it on the move, to riding in a pack and understanding hand signals and using them. As I got stronger and faster, my balance improved and I could manage my numb hands and toes better. I loaded up the Strava app on my smart phone and was able to track my speed and I slowly saved time off each lap of the park and each outing, going faster and further every time. Family support was hugely important as training is time consuming and having someone at home to help coach and train me made a great difference. My bike went on holiday with me for a week so that I wouldn’t miss training. Back home, I was taken around the Surrey Hills and I managed 2 x 60 mile round trips with 3 proper hills in each. I’d done as much as I could in the time available. I was ready - or so I thought! So, off we went. At 53 I was the oldest and the only woman, and definitely the least fit. But the rest of our 5 strong team were hugely supportive and never made me feel less than capable. Just-Pedal provided the support and I could not speak more highly of them. The whole trip was amazingly well organised and thought through. 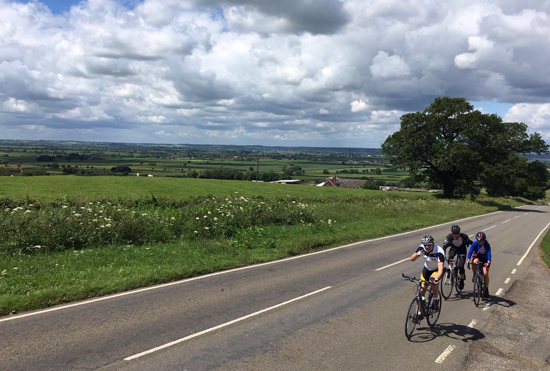 The route covered some truly beautiful parts of the country but also some of the most challenging! Reaching the highest point of the trip in the Peak District outside Sheffield was the most physically challenging thing I’ve ever done, but I did it! Days 2 and 3 had their challenges, but the team looked after me, gave me a helping hand up the worst of the hills and applauded me every time we stopped. Eating huge amounts of proper food to fuel the trip was psychologically counter-intuitive, but it had to be done - cake stops were very important. Arriving in London 3 days later at the Tower of London to an amazing welcome by the Missing People team was truly memorable! The cobbles were less kind to us but luckily short-lived. I started up a Just-Giving page and used social media and emails regularly to encourage my network to dip into their pockets. 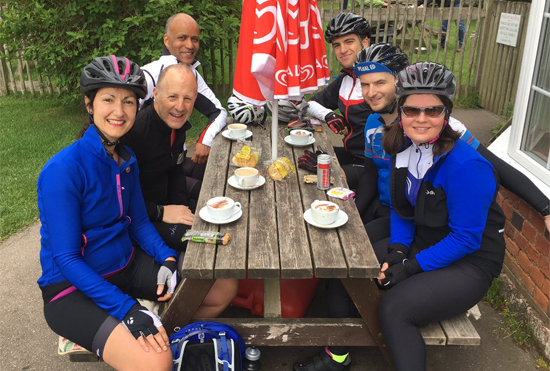 Regular updates and photos both before and especially during the ride helped me to raise (including Gift Aid) over £4,000. Keeping the money in mind as I struggled up the hills definitely kept me going. This was an amazing challenge which I’m so glad I undertook. It has started me off on a new fitness regime and as long as the next cake and coffee stop is less than 30 miles away, sign me up!